When blood flow to a section of heart muscles is blocked, a heart attack occurs. If this blood flow to heart muscles is not restored quickly, the section of heart muscle begins to die due to lack of oxygen. Heart attacks usually occur as a result of coronary artery disease. Coronary artery disease is a build up of plaque on the inner walls of the coronary arteries.Eventually; a plaque section breaks open which causes a blood to clot at the site. A heart attack then occurs if that clot becomes large enough to cut off most of the blood flow through the artery. As a result of this blocked blood flow, heart muscles become devoid of oxygen-rich blood fed by the artery. 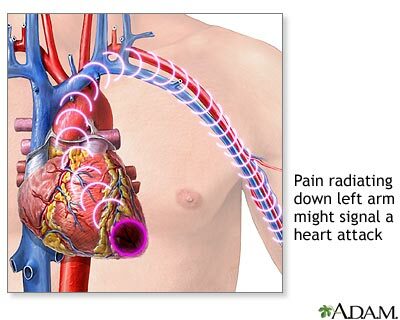 Heart attack can also occur due to problems in microscopic blood vessels of the heart. This condition is known as microvascular disease and is more common in women than men. Warning signs of heart attack are not same for everyone. Some people have silent heart attack symptoms.